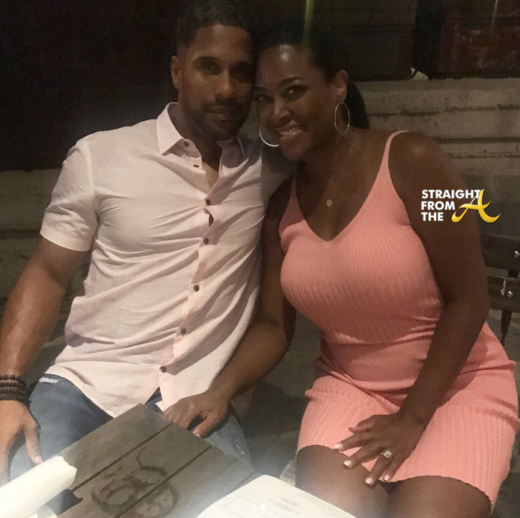 Kenya Moore shared the photo above from date night with her husband Marc Daly and it seems that she’s trolling yet again. Moore had to know that the photo above would draw criticism of her expanding baby bump, but she let naysayers have a field day about the lack of a baby bump in what was presented as a current photo. 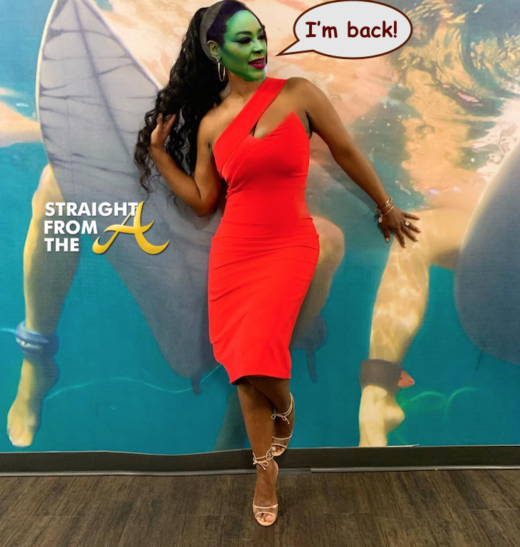 I exclusively reported that Kenya’s peach had been snatched for The Real Housewives of Atlanta’s 11th season months ago (click HERE if you missed that) and now that the news is finally being confirmed it seems the peachless ‘housewife’ is desperately seeking a bit of positive press. Less than 24 hours later after the season 11 cast appeared on a group outing in Atlanta, the desperate ‘housewife’ shared a slew of new photos as proof that she’s currently rocking a bigger baby bump. Kenya Moore and her growing baby belly were spotted out and about in Atlanta last night (July 1, 2018). Kandi Burruss of The Real Housewives of Atlanta played host to a watch party for her new ‘Kandi Koated Nights’ talk show at her home and Moore was among the invited guests. During Kandi’s live, she forced an apprehensive Kenya Moore stand up and show her baby bump. 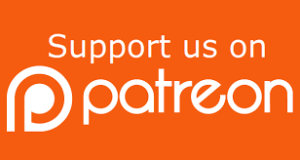 The Real Housewives of Atlanta is currently in the process of filming it’s 11th season and since Kenya Moore no longer has a peach, it seems she’s decided to skip town for a while. 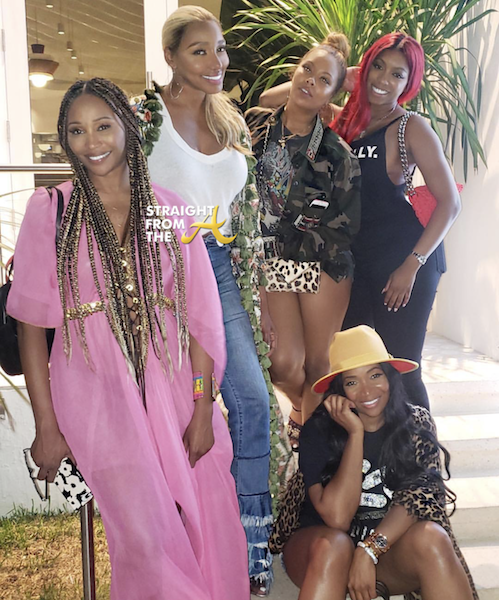 As you know, the season 11 cast were all in Miami this past weekend celebrating the launch of Nene Leake’s Swaggalicious Boutique chain (click HERE if you missed that) and many ASSUMED that Kenya’s couldn’t travel due to her condition. Welp… Kandi Burruss certainly put those rumors to bed after crossing paths with the former ‘housewife’ in the Atlanta airport. 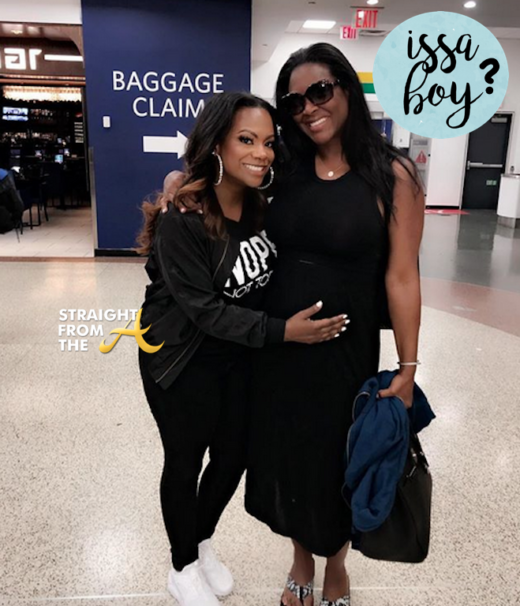 Kenya playfully responded to Kandi and many feel her comment may have inadvertently revealed the gender of her unborn child. Word on the curb is that Kenya Moore has been demoted to ‘friend of the show’ but it seems the former ‘housewife’ isn’t taking the news lying down. 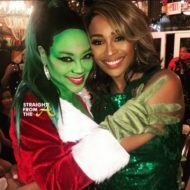 As previously reported, Kenya did NOT receive a pick-up letter for season 11 (click HERE if you missed that) and without a peach, Moore’s only alternative in returning to The Real Housewives of Atlanta cast would be as a ‘friend’ of the show. Kenya hit the net today to say that she’s standing strong and that either she’ll be returning with peach in hand or she wont be returning AT ALL! 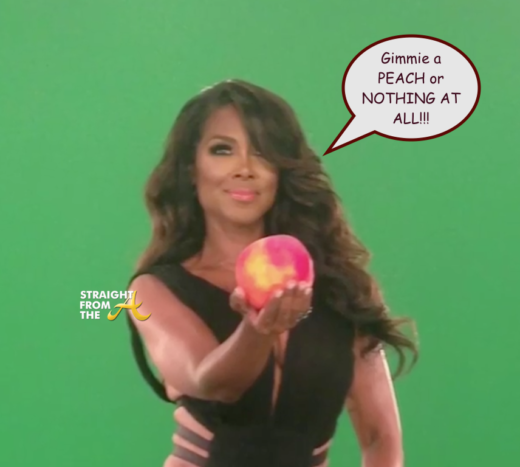 Kenya Moore of The Real Housewives of Atlanta is apparently on the grind now that she’s rumored to have lost her peach for season 11. The newlywed hit the ‘gram this past weekend to offer up more photos of her expanding waistline in a social media ad for yoga pants.